Duncan Duane Hunter (born December 7, 1976) is an American politician and member of the Republican Party from California who has represented San Diego County in the United States House of Representatives since 2009, representing California’s 50th congressional district. The district, numbered as the 52nd district from 2009 to 2013, covers almost all of San Diego County except for the coastal and border areas. It includes the cities of Escondido, San Marcos and Santee as well as Fallbrook, Lakeside and Valley Center and mountain and desert areas stretching to the Imperial County line. On March 20, 2007, Duncan’s father, Republican Congressman Duncan Lee Hunter announced that as part of his 2008 presidential campaign, he would not seek re-election to the House of Representatives in 2008. Duncan D. Hunter announced his candidacy for his father’s seat and on June 3, 2008, won the Republican primary to replace his father. 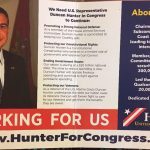 In 2017 it was reported that Hunter is under criminal investigation for alleged campaign finance violations. 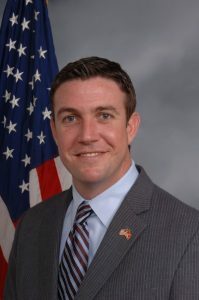 In March 2017 the House Ethics Committee deferred its probe into the alleged misuse of campaign funds by Rep. Duncan Hunter at the request of the Justice Department. The Justice Department makes such requests when it is conducting its own investigation. This entry was posted on May 19, 2018 by administrator.